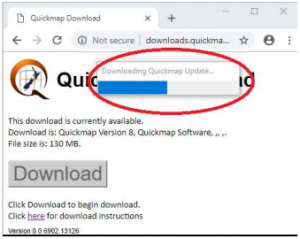 This article covers the Client-Server installation, see this article for information on how to install Quickmap in a Standalone configuration. The first step is to install both the software and data onto the server (recommended). 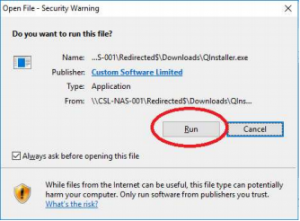 The software does not need to be run or registered after installation (and will therefore not require a license), the software installation is only required to copy the software installer to the data directory so it can be run later to install client machines (the benefit being that the client install will automatically specify the correct data directory location). If you do not want to install the software on the server, then you can use the Data Only option for the Server install, then specify the location of the data on the client during the client install. Additionally, the client installation may also be aware of the data directory on the server (from previous registry settings) if you have already installed Quickmap on that client computer at some point. 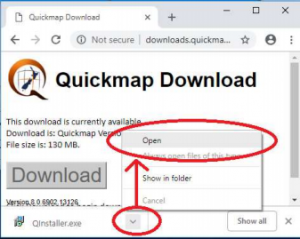 To install Quickmap on the server, after you have clicked on the download link provided to you by Custom Software Limited, or pasted the URL into your web browser, a webpage similar to the screenshot below will be displayed. This screen will tell you what you are going to download, and how big the download is. ❗ If you have been given a zip download for the server installation (containing only the software files), the instructions for that are available here. You will then need to share your data directory to the clients (such as through a network drive or UNC share). How to do this is beyond the scope of this article. Perform a silent installation on the client, specifying the data directory. This entry was posted in Knowledge Base and tagged QuickmapSetup.Config, Silent Installation by Webmaster. Bookmark the permalink.